If you are here that means you watched “The Great Gatsby” movie and its totally impressed you. Gatsby style fonts are imbued with Art Deco spirit. Fonts are very beautiful, have a lot of decorative elements made in the spirit of thar epoch. 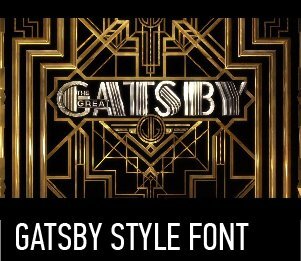 Gatsby styled font will looks great in decorating works, and will glam up any party if you use this font in invitations or banners.